Villagers priced out of the housing market in North Mundham, West Sussex, have reason to celebrate with the opening of Stoney Meadow, a development of 25 affordable Stonewater homes. Social housing provider Stonewater has created the scheme, which offers a mix of low-cost rental and shared ownership homes, to meet a chronic shortage of affordable housing in the village for local people. The sensitively-designed rural housing development has been financed by Stonewater with an additional £595,770 grant and recycled grant funding from Homes England. Currently, only 8% of rural housing across the country is affordable compared with 20% in main urban centres1. Stonewater has worked closely with Chichester District Council and local developers Hamlet Homes to deliver the new housing community which offers a mix of four one-bedroom apartments, three one- and two-bedroom bungalows and three two-bedroom houses — all for affordable rent. The low-cost shared ownership homes include a two-bedroom bungalow and 14 two- and three-bedroom houses. Built to help house local people struggling to find homes that they can afford, the rental properties will be allocated through Chichester District Council’s Choice Based Lettings system which prioritises people who already have a local connection. “At a time when the average person in the Chichester area would need a 265% pay rise to afford an average home2, more young people and families who have grown up in the village are finding themselves forced to move away to find affordable housing,” said Jonathan Layzell, Executive Director of Development at Stonewater. “Local people looking to rent are also being priced out, with the average rent eating up almost half (43%3) of their earnings. This has a devasting impact on the sustainability of village shops and local services which is evidenced by the closure of 31 post offices across the South-east in the past five years, and 217 pub closures between 2013 and 2016 in London and the South-east. The energy-efficient homes feature gas central heating and low-energy lighting to help residents save money on their energy bills. 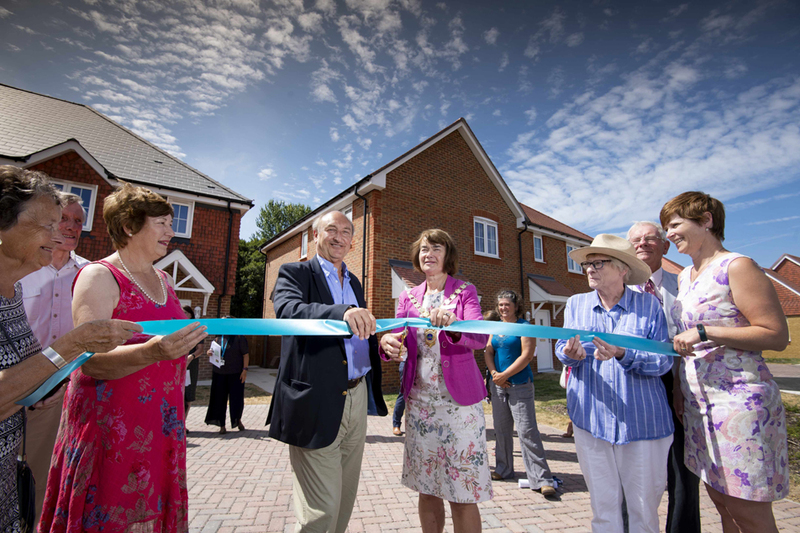 Pictured above from left to right George Blunden, Stonewater Chairman and Cllr Elizabeth Hamilton, Chairman of Chichester District Council cut the ribbon with guests at the opening event. Pictured from left to right: Victoria Westaway, award-winning willow sculptor and George Blunden, Stonewater Chairman. 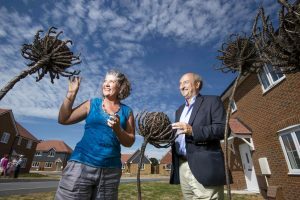 As part of Stonewater’s commitment to creating a ‘sense of place’ in its developments, it commissioned award-winning willow sculptor, Victoria Westaway, to create and install sculptures in the shape of round-headed rampion flowers — the county flower of Sussex. Known as the ‘pride of Sussex’, it grows mainly in grassland and meadows, linking the design to the Stoney Meadow development.